Shortcodes are a convenient method that WordPress implements which provides a way to generate dynamic and often complex functionality from very little input. While developers often create functionality to provide additional features for a website; they are executed by calling PHP code. Users however, are often not developers, and as such having them interact directly with PHP is not recommended. A solution to this is for developers to create custom shortcodes. Shortcodes provide a level of dynamic content for the user, allowing them to create power features on their website by using pseudo-code that act similar to macros. The shortcode when called will take its arguments (if any) and then run through a function which defines what custom functionality will occur. Shortcodes have to be registered on your website in order for them to be used. There are several ways in which shortcodes can be added to your website, here are a few common methods. 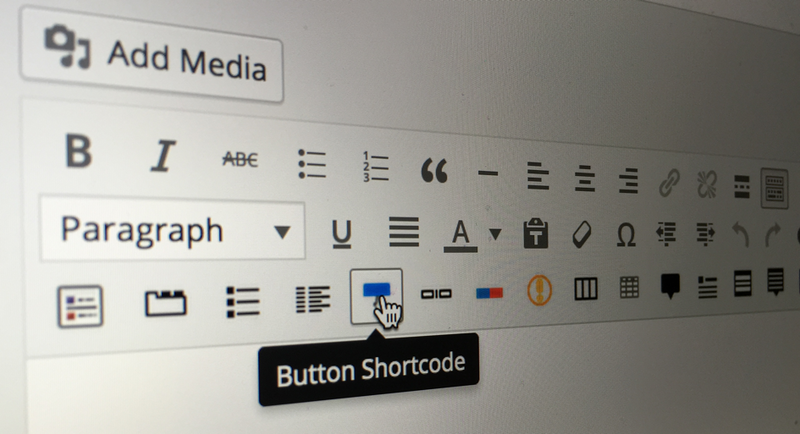 WordPress actually comes with a series of shortcodes already defined. These shortcodes are generally used for galleries, captions, audio and video elements and mostly related to the media side of WordPress. For example, you may want to display an inline video player on your page. By using the video shortcode as follows [video src="video-source.mp4"] you can define that a video player will be outputted on your page / post. A lot of theme developers will provide a series of shortcodes that you can use to add a lot of extra functionality to your website. These shortcodes may create interactive elements, display content in visually stunning ways or be very informational. However, a theme may also have no extra shortcodes at all. Most plugins that offer some sort of content (such as forms, sliders, interactive elements) will come with a shortcode that you either configure on a case by case basis (you add the options inside the shortcode on the desired page) or is configured globally (inside a plugins theme menu for example). These plugin shortcodes often are well documented on the developers website or the plugin repository for WordPress, giving you an instant idea of what exactly you can do with your shortcode. For example, you may want to show your product cart on a WooCommerce powered website, you could do this by using their cart shortcode [woocommerce_cart]. These shortcodes are outlined on their shortcode documented page. Now that you know what shortcodes are and how they can be added to your website, we can discuss the two different types of shortcodes and how they differ. Non Enclosed shortcodes are shortcodes that do not contain or wrap other content. These shortcodes exist as a single self closed unit. For example, say you wanted to display a gallery in your post, you would use the [gallery] shortcode. This shortcode would execute and display a gallery that would be outputted on the page. Enclosed shortcodes are shortcodes that contain other elements or content. These shortcodes look similar to the non enclosed variety of shortcodes, but they will have a beginning and end element. For example, say that you wanted some text on your page to stand out. You could define a shortcode that takes its wrapped content and applies a set style (such as making it bolder or bigger). Notice how we have a start tag and an end tag? All of the content between there will be passed into the shortcode and processed in some way. Overall, when you are dealing with shortcodes you will deal with one of these two types. Creating shortcodes for use in WordPress is fairly straightforward. It involves a callback function that defines what the shortcode will do and the use of the add_shortcode($name,$callback_function) function that registers the shortcode for use. To register your own shortcodes you will need to place them inside your functions.php file inside your child theme (or if you have another file that has access to PHP you can use this also). Remember to never edit a parent theme directly! The functionality that a shortcode performs is defined inside the callback function. The callback function returns a value and that value is what is displayed to the end user when generating their page/post. This returned value might just be a value wrapped in a container for styling, or it may be as complex as outputting a dynamic form element or slider. While shortcodes just need a callback function to operate; shortcodes can take arguments (options) that can be used to dynamically change how the shortcode functions. The $attsvariable is an associative array of options or settings that you would like your shortcode to have access to. Shortcodes will often provide the user with a series of settings which they can pass into the shortcode to give them the ability to alter the output. For example, consider the inbuilt audio shortcode . This shortcode (since WordPress 3.6) gives the user the ability to embed a HTML5 audio player into the page. By default you can use the shortcode just as it is. However you can also customise its options by passing in arguments such as the following . This allows you to set the audio to pre-load as soon as the page loads, along with automatically triggering the audio (and once the audio is finished it will loop). These settings along with others can be customised by passing in values. The first thing you will see is that we called a function named shortcode_atts(). This function is used to return an associative array of values for you to use. This function takes in your $atts variable and also defines nice default options for you to use (this takes the hassle out of merging arrays and controlling data yourself). In our example $values will have access to one value called profession_type, however, if we defined more default values we could also access them. Once we determine the value for profession_type we format a string and return it for display to the end user. The $content variable is used for enclosed shortcodes and this value represents any content that exists between the opening and closing tag of the shortcode. For example, if you have a shortcode that makes selected text really small such as [small_text] This text will be small [/small_text]. The value of $content will be ‘This text will be small’. This variable gives the shortcode access to the content and it is how shortcodes directly apply styles and functionality to the selected areas. Let’s look at a coding example to illustrate this. The returned content will be styled differently, wrapped around by a span. On a related note, if you are creating shortcodes that use the $content variable, you can also use the do_shortcode($content) function. This function will take the content and run any other shortcodes inside of it. If you don’t include this and you wrap a shortcode inside another shortcode, the inner most shortcode will simply display text instead of being transformed. The $tag variable contains the name of the shortcode itself. This is often used for shortcodes that share the same callback function. When you define multiple shortcodes and use the same function to handle all of them you can use the $tag variable to distinguish what shortcode is being called. Depending on what shortcode you call (either [my_primary_shortcode] or [my_secondary_shortcode] the content will differ. To register a shortcode all you need to do is call the add_shortcode($name, $callback_name) function. The shortcode name itself should be all lowercase and with only digits and underscores. There have been long standing issues with the use of hyphens in shortcodes so I would simply define your shortcodes without them, but you are free to do so if you are feeling adventurous. Now that you have a thorough understanding of how shortcodes work and how they can be used to provide non developers with extensible options, you can create your own shortcodes and really extend your upcoming WordPress websites.